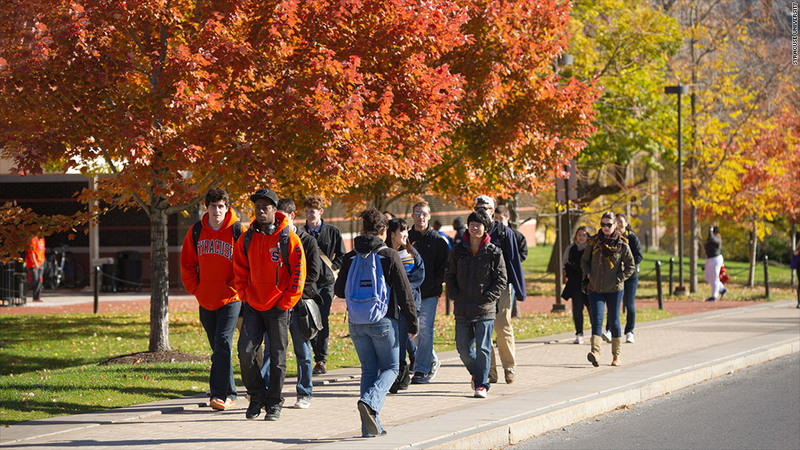 Syracuse University identifies students who are overborrowing from private lenders gives them direct grants for future semesters averaging $5,000 to $7,000 per year. In an effort to reduce student loan default rates, some colleges and universities are launching programs to improve student-loan literacy and, in a few cases, offer other kinds of financial assistance to students so they don't get too deep into debt. It's not entirely altruistic. Universities and colleges are increasingly being judged on their average loan debt and default rates, and stress about finances can derail students and cause them to drop out at a time when funding of public higher education is increasingly tied to success at producing graduates. (Read: The other reason students are drowning in debt). Syracuse University, for instance, identifies students who are overborrowing from private lenders and helps them stop by giving them direct grants for future semesters averaging $5,000 to $7,000 per year. Called the Money Awareness Program, the initiative has reduced the debt of some 90 to 100 sophomores, juniors, and seniors per year by an average of $21,000 each. In exchange, recipients are required to attend money-management courses once every semester until they graduate. Alvernia University, a Catholic liberal arts college in Pennsylvania where 86% of undergraduates have some type of loan averaging about $10,000, requires that all of its incoming students take an hour long financial management seminar. An experimental program called Aid Like a Paycheck, being tested on low-income students at community colleges in California, Illinois and other states, parcels out student scholarship and grant money not in one or two lump sums each semester, but in smaller portions every two weeks in order to teach recipients to budget and manage their money better. It may be expanded to include loans. Of course, giving students money so they don't have to take out loans in the first place is the easiest way to slow the mounting red ink. In a program called Opening Doors, which was launched in 2003, Louisiana offered $1,000 performance-based scholarships to students on the condition that they stay in school at least half time and maintain a GPA of 2.0. Retention and the number of credits students earned improved, but the pilot effort was cut short by Hurricane Katrina and is only now being tried again, with support from the Bill and Melinda Gates Foundation, at six community and technical colleges in California, Louisiana, New York, and Ohio. Meanwhile, City Colleges of Chicago is attempting to make the application process more meaningful by requiring students to fill out separate forms before they take out loans, rather than simply checking off a box on one financial aid form. The colleges also require all students to attend mandatory "college-success" seminars that include financial advice and meetings with counselors, who hand over what might be the most effective deterrent to financial risk: a copy of the applicant's borrowing history. So far, the program has been a success. Fewer than 100 of City Colleges' 120,000 students now take out any private loans, and the average annual debt from any source is just $511.